The psalms have been called “a mirror of life” — a description that fits Psalm 51. This psalm grew out of the darkest experience in the life of King David — his adulterous relationship with Bathsheba and the orchestration of her husband Uriah’s death (read about these events in 2 Sam. 11–12). David tried to hide and keep silent about his sin but was confronted by Nathan the prophet. David consequently acknowledged his sin against the Lord. The words of this psalm certainly speak to and for every speechless sinner who has ever felt the agonizing pain of sin and struggled to find the way back to God, to forgiveness, to restoration, and to usefulness once again. Nathan will come! | When we sin, God will convict us. If we fail to respond accordingly, God will send a Nathan to confront us. God will send Nathan when we shun correction and persist in concealing our sin. And even though Nathan’s message is painful, God sends him in the hope of redeeming and restoring us. According to the greatness of Thy compassion blot out my transgressions. David appealed for mercy even before he mentioned his sin. He asked God to blot out or wipe away his transgressions as one would erase the writing from a ledger (see also Isa. 43:25). The word transgression describes a willful and deliberate act of rebellion against the revealed commandment of God. It means to step beyond the boundary, to enter into a territory where one should not pass. Sin always leaves a stain, always defiles, and always makes us filthy on the inside. David asked God to wash him from his iniquity and cleanse him from his sin. The words wash and cleanse suggest repeated action to whatever extent it takes to make one clean, like repeatedly laundering a filthy garment. The word iniquity means crooked, perverse, or twisted conduct. It suggests a departure from the straight way. The word sin means to miss the mark. David did not ask God to remove the consequences or the punishment of his sin. His primary concern was the impact of his sin on his relationship with God. We must go to God for cleansing. | God alone can cleanse us from sin. We cannot cleanse ourselves nor can others cleanse us. He alone can reach into every tiny and secret place where the filth of sin has seeped in and left its stain. The use of the personal pronoun my tells us that we must first own our sin before we can disown it. We must first acknowledge and then abandon our sin. We must first confess and then forsake our sin. 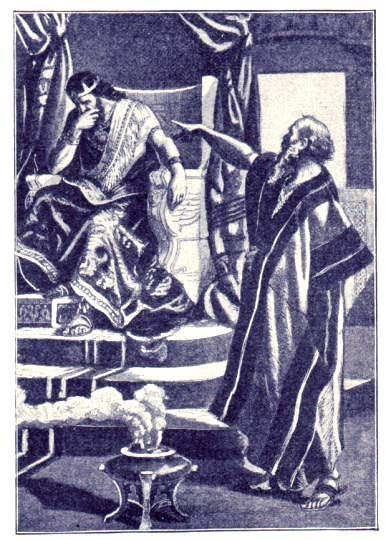 David accepted responsibility for his sin. He did not blame others. He did not make excuses or try to rationalize his actions. He did not try to point out extenuating circumstances. He knew his transgressions. He knew where he had stepped beyond the boundary to engage in deliberate acts of rebellion against God. David’s sin was ever before him. He could not escape the guilt produced by unconfessed sin (see Ps. 32:3-4 and Prov. 28:13). It haunted and troubled him. God never designed us to be garbage containers. | When we allow unconfessed sin to remain in our lives we endanger ourselves. In Psalm 32:3-5, David described the torment brought about by unconfessed sin. Unconfessed sin is like an infection that unsettles us spiritually, emotionally, psychologically, mentally, and physically. It robs us of peace, joy, strength, and security. Unconfessed sin has destructive power. God never designed us to bottle up garbage. We must confess our sin. And blameless when Thou dost judge. When Saul violated the Lord’s command and Samuel’s instructions he said, “I have sinned” (see 1 Samuel 15:24). When Judas tried to return the thirty pieces of silver to the chief priests and elders he said, “I have sinned by betraying innocent blood” (see Matt. 27:4). However, when David sinned he said, “Against Thee, Thee only, I have sinned, and done what is evil in Thy sight.” David’s sin was certainly against Bathsheba, Uriah, the nation, and himself. However, David understood and acknowledged that ultimately his sin was against the God who had created him. And because he had done what he knew was evil in God’s sight, he knew that he would not be able to find fault with God’s judgment. Our sin is always against God. | We must understand that before we can say “yes” to sin we must first say “no” to God. And, when we say “yes” to sin we are, in essence, saying to God, “I do not honor (to give weight and consideration to) Your Word.” We must also understand that the sin we commit is always committed in God’s sight (see Ps. 139:1-6). No one ever sins behind God’s back. This verse should not be taken to mean that David was the product of an illegitimate union, but rather that he was a sinner by birth as well as by choice. David understood that he had been born into a sinful world. God desires that we be sincere in the innermost being — the place where our priorities are established and our decisions are made. David asked God to use hyssop (a plant frequently used in ceremonies of cleansing and purification) to cleanse him inwardly. David longed to hear joy and gladness, two of the things we lose when we sin against God. The latter part of the verse probably refers to the manner in which shepherds dealt with a lamb given to straying. The shepherd would break its legs, wounding the lamb for its own good. The shepherd then set the broken bones and carried the lamb on his shoulders until its legs were healed. The experience kept the lamb from straying again. God always disciplines us for our good. | The Lord’s discipline is never capricious or cruel. God’s disciplinary actions are always redemptive in nature. He always disciplines us for our good. David asked God to not look upon his sin but instead to blot out or erase everything recorded against him. He asked God to cleanse, cancel, and destroy every and any thing that testified of his sin. David asked God to create in him a clean heart, not to restore the old one. He asked God to radically change and transform him from the inside out. The background of this verse is probably 1 Samuel 16:14 which speaks of the Holy Spirit departing from Saul or Judges 16:20 regarding the Lord departing from Samson. David asked God to bring about the restoration of what sin had taken from him — the joy of Thy salvation. Sin always robs the believer of the joy, and sometimes even the assurance, of salvation. And sinners will be converted to Thee. Those who have experienced God’s grace cannot keep silent. | David vowed to proclaim the message that God forgives. His heart overflowed with gratitude and praise to God for His forgiveness. We too, should proclaim the forgiveness of God. Thou art not pleased with burnt offering. God will not accept ritual as a substitute for repentance. David understood that God was interested in more than sacrifices. God was interested in a heart that was right with Him. Burnt offerings were not enough. God required a broken (torn or shattered) spirit and contrite (bruised or crushed) heart. These terms suggest that a forgiven individual must continue to have a deep sense of contrition for sin and its consequences even after being pardoned. Then young bulls will be offered on Thine altar. David turned his attention to the city of Jerusalem. He did not want for his conduct to hinder God’s blessings or favor on the city. He asked God to bless the city with security and prayed that walls be built around Jerusalem. David closed the psalm by recognizing the value of sacrifices and ceremony in the religious life of the city.